ReutersBar owner Salvatore Calabrese holds his ‘Salvatore’s Legacy’ cocktail during his attempt to create the world’s most expensive cocktail, at his bar in Mayfair, central London October 11, 2012. If you know anything about Wall Street, you know that there are rules. Most of them are not written anywhere, you simply learn them through observation. Part of learning is observing how people follow those rules, and another part is laughing when people get punished for breaking them. There are rules for clothing, rules for eating, rules for everything — even drinking. “Guys get made fun of when they drink anything from a martini glass,” said Dan Nathan, a veteran trader and editor of Risk Reversal. That is, unless it’s a martini. Dry. “[They get made fun of] when they drink anything with Campari in it,” Nathan added. 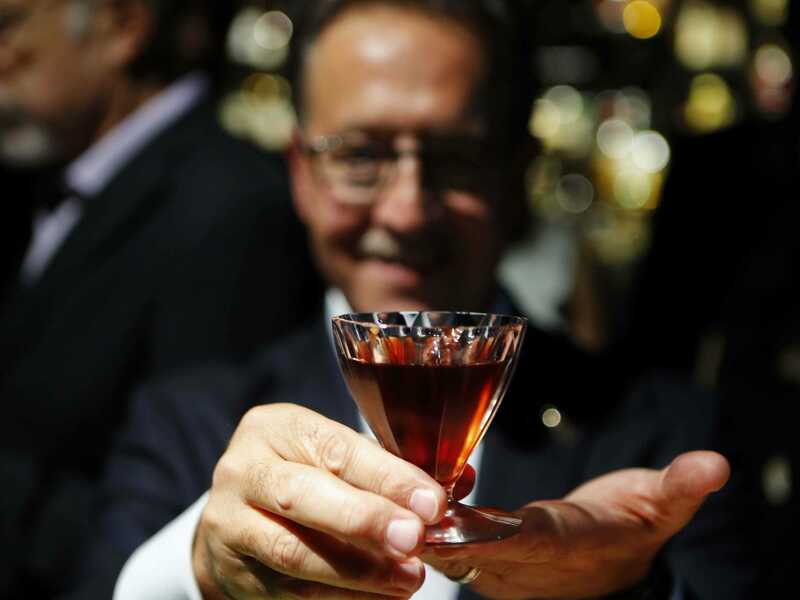 Unless of course it’s a Negroni — but even that, says Nathan, feels contrived. Wall Streeters are, historically, drinkers of brown liquor. Neat. But that is changing. Talk to bartenders around Manhattan and they will tell you that some cocktails are beginning to creep into the mix. Now this isn’t to say that the old spirits are dying. You can still put a bottle Macallan on a string and watch as a bunch of bankers start to follow it up and down Midtown. But bartenders around Manhattan started to notice a subtle shift around 2011. This shift, of course, had to be served up in a rocks glass however. The cocktail shift has ushered another subtle change along with it — the rise of the craft distillery. On Wall Street that has translated into smaller brands of liquor gaining traction, like Tito’s Vodka. “All the people 5 years ago that you couldn’t get to drink Tito’s are drinking it now,” said McCarthy. Back then he was at a bar in the Lower East Side, and only real vodka-heads and cocktail snobs knew about the brand. Here’s the thing — all you really need is for a few of the higher-ups to take to something on Wall Street, and you’ll see others start to follow suit. “People are posers when it comes to drinking,” Nathan told Business Insider. Posers? On Wall Street? Get out of here.